This year, I’m making a resolution about my New Year’s resolutions at work: They will be small in number, and they will be data-driven. I’m going for targeted changes, backed by some evidence they will work. For talent acquisition professionals who have committed to treating their job candidates to a great experience this year, Montage has some data to share that will make your resolution easy to define. Our recent studies with active job seekers revealed just how damaging two very common interview practices can be on your hiring process – being late and being unprepared. Most candidates take a dim view of being made to wait. In research with 200 active job seekers, 80 percent agreed that if their interviewer is more than 10 minutes late, they will have a negative impression of the hiring company. While 10 minutes doesn’t seem to be a significant amount of time, that negative impression nullifies all of the work you’ve done (and the investment you’ve made) in being seen as a desirable employer. For job seekers in the $100-$150K income bracket, the saying “time is money” certainly applies. One hundred percent of those respondents confirmed that they would be left with a negative impression of any company whose interviewer is more than 10 minutes late. This research is also critical if you’re hiring from the younger generation. The 18-24 year-olds who may seem to have all the time in the world do not have patience when it comes to interviewing. Seventy-eight percent in this age bracket are left with a negative impression of the hiring company if the interviewer is late by more than 10 minutes. From the video interviewing perspective, I can share a bit of insight on candidate and interviewer behavior from our corner of the industry. We find that the virtual world mirrors the physical world. Candidates will arrive in our Montage live interviewing technology about 10 minutes early. While there, our support rep welcomes the candidate and keeps him occupied while waiting for the interviewer(s) to arrive. At least in our scenario, we can mask a late arrival through the services of our support team. 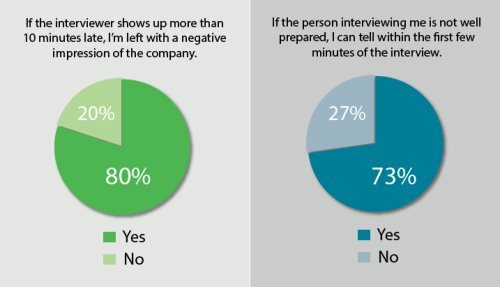 A separate study commissioned by Montage found meaningful results when querying active job seekers about preparedness of their interviewer. Of 200 respondents, 73 percent agreed with the statement, “If the person interviewing me is not well prepared, I can tell within the first few minutes.” Now more than ever before, the hiring process serves as a two-way evaluation. Job seekers are highly attuned to this process as a reflection of their possible future employer. Women are more tuned in than men. Seventy-nine percent of women agreed they can tell within the first few minutes if an interviewer is not well prepared, compared to 67 percent of men. Age makes a difference. For job seekers between the ages of 35 and 54, 85 percent agreed they could tell in the first few minutes. Of respondents age 55-65, 92 percent agreed they could tell. Location also makes a difference. Seventy-seven percent of city dwellers and 74 percent of suburbanites agreed they could tell an interviewer was not well prepared, compared to 40 percent of rural residents. 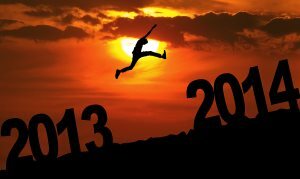 How many talented individuals will decide this is the year to find a better job? How many of those star performers will you successfully attract, but lose during the hiring process? It’s never too soon to make the adjustments needed for a new, improved and winning candidate experience.